On the night Michael Jackson died, I was appropriately paying homage to another fine musician. No disrespect to the man as a musician - his music was world changing… 25 years ago… and then theres also the media’s (and the worlds) apparent loss of memory regarding his rather blatant indiscretions. 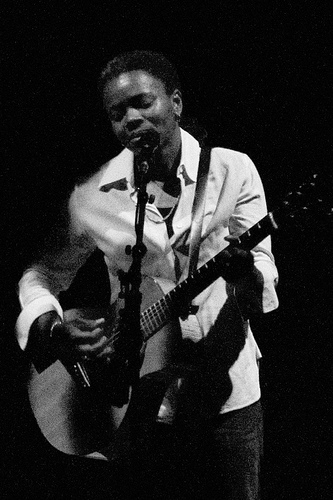 In stark contrast, Tracy Chapman, also a pop prodigy of the 80’s, is still producing great music, touring, and looking a picture of health in body and mind. Indeed, her most recent album ‘Our Bright Future’ and reason for touring, is as good as any of her prior albums. It was a great gig, even if it was overshadowed by the MJ factor - having listened to Tracy many many times over the last 2 decades, it was fantastic to finally have caught her live. This entry was posted on Sunday, July 12th, 2009 at 1:24 pm	and is filed under Tracy Chapman, Pop. You can follow any responses to this entry through the RSS 2.0 feed. You can leave a response, or trackback from your own site. Thank you very much for uploading this- my girlfriend is a huge Tracy Chapman fan and will be delighted I downloaded it for her! Just wondering: does cover art exist anywhere for this one, or would anyone be considering making some? I spent hours on the net trying to find it! Cheers.